Created February 27, 2018. Major updates February 28, 2018. Minor addition April 22, 2018. I really wanted to like the AmpliFi mesh router system. I have installed one standard AmpliFi system (a square router and two candlestick shaped Mesh Point antennas like the one shown in the image at the right), and another system that consisted of two routers, no candlesticks. I have also tried using a stand-alone Mesh Point as a Wi-Fi extender. This has been a disaster. The issues described below are just my latest battle with the candlestick Mesh Point, there were others along the way. I started clean by resetting a previously used mesh point with a paper clip. Then, I downloaded the current Android app, version 1.8.0 to an Android 5.1 device. Then, I used the app (Setup AmpliFi Standalone Mesh Point option) to connect the Mesh Point to a Wi-Fi network created by a non-Ubiquiti router. This initial setup requires Bluetooth. On Android 8.1 (but not on Android 5.1) it also requires Location to be enabled. It went well. For the initial setup, your mobile device does not have to be connected to the SSID being extended. However, after telling the Mesh Point to connect to the target SSID and entering the password of the target SSID, then, you do need to be connected to the target SSID to see the Mesh Point. Then, I set an admin password for the Mesh Point that is different from the Wi-Fi password. When doing so, the app let me see the password I was setting, which is always good. The initial screen of the app notified me front and center about an available update to the firmware. I told it to update the firmware to v2.6.2 and things went bad at that point. The Android app can no longer find the mesh point. The error, shown here at the right, is: Unable to locate device. The instructions in the app are clearly wrong. It says (in the orange/yellow stripe) to connect to the Mesh Point by name. Clicking this button opens the Wi-Fi settings on the Android device despite the fact that Mesh Point does not create its own Wi-Fi network named after itself. It is extending an existing network. At this point, I contacted AmpliFi tech support. The response was useless, which was in line with my previous interactions with Ubiquiti. They asked if I was using an AmpliFi HD kit (Base station + 2Mesh points) even though I said that I was connecting to a non-Ubiquiti router. They also asked the distance between the mesh point and the base station, despite my saying that everything was in the same room and that it was working prior to the firmware update. Next, I tried cold booting the Mesh Point. I powered off the Mesh Point, waited a minute, plugged it back in and waited for the 5 blue LEDs that indicate all is well. Then, I restarted the app from the beginning saying I wanted to setup a new Mesh Point. The app just hangs searching forever for a Mesh Point. Maybe the admin password for the Mesh Point was too long? There is no documentation about how long it can be. Or, maybe the bug was because I used a different password for the Mesh Point at all? It defaults to using the Wi-Fi password as the admin password for the Mesh Point. Next, I tried an Android 8.1 device, also running the latest version of the app. This failed too. The app has no option that obviously fits my situation. My first guess was the bottom option, "I already have configured AmpliFi. "This seems to only refer to AmpliFi routers, not to Mesh Points. Thanks for the confusion, Ubiquiti. It didn't find any AmpliFi routers. Next, I tried the middle option, "Setup AmpliFi Standalone Mesh Point" despite the fact that my Mesh Point was already setup and configured. The app immediately wanted me to turn on the Location setting in the Android device. Why it needs this, I don't know. Bluetooth was on and if Bluetooth is not what the app uses to find a Mesh Point then what purpose does Bluetooth serve? Needless to say, none of this is documented, the documentation is scarce and useless. I turn on Location and the app starts looking for mesh points as shown here to the right. It says that way forever. The next day, I realized my mistake. This Android device was not connected to the SSID that the Mesh Point was extending. But, AmpliFi is just as much to blame as I am. The software should have warned me ahead of time that this was a required pre-req. And, when it couldn't find a Mesh Point, it should have suggested that I verify the device is connected to the same SSID. Clearly the software was not written for my use case - a single Mesh Point and a non-Ubiquiti router. Finally, there is no excuse for an app to loop forever trying to do something. Still, even connected to the right SSID, there were annoyances. When entering the admin password, the app does not let you see it. I chose a long password which makes typos more likely. My first attempt at entering the password failed. Second attempt also failed. At this point, I turned off the VPN on the Android device and the third attempt at entering the password worked. Cause and effect? I can't know without being able to SEE the password I type. If the VPN did get in the way, then AmpliFi should warn about this. The first thing the app did was ask about Remote access to the Mesh Point. I skipped that for the time being, as I just wanted to see if the app worked at all. But, after clicking on the SKIP button, it wanted the password again. WTF. This time I did not enter the password, I clicked on a CANCEL button. And, I am still not into the app. Instead I am at the screen showing that the Mesh Point was found, the screen where you click on the Mesh Point to enter its password. I clicked on the Mesh Point and got into the app, without entering a password. What awful software. After both Android devices failed, I tried an iOS device, using the latest version of the AmpliFi app, one released in Feb. 2018. The iOS device was connected to the same SSID as the Mesh Point and did not have Bluetooth enabled. Magic! It found the Mesh Point. There was no need to chose an initial path through the app, it just worked. However, once I clicked on the Mesh Point and got prompted for the password, things got messy. The first annoyance was not being able to see the admin password as I was typing it. Those of us that use long passwords, really need to see them. The first time I entered the password, it was rejected. The second time, I was extra careful, but still ended up with an error message: Oops - something went wrong. Please try again later. I do try again, and this time the app connected to the Mesh Point without my having to enter a password. What awful software. As shown at the right, when I did get in, the app reports that everything is great. But, it is not. Do you see in this initial screen where it says there is 1 client. When I clicked on that, it reported that there were no devices connected to the Mesh Point. I ran a speed test and it completed, but for the life of me, I could not find the results afterwards. Interestingly, after using the iOS app, I finally got the Android app to work and the Android app showed the result of the speed test that I had run from iOS. As a test, I then connected the iOS device to a different SSID. Just as with Android, it reports that it is "Unable to locate device" (shown at the right). Also like Android, the instructions are wrong. It says to "Open WiFi settings and connect to xxxx" where xxxx is the serial number of the Mesh Point. At no point, do you connect to a Wi-Fi network whose name is the serial number of the mesh point. Considering this is mature software, mistakes like this are quite disappointing. It also suggests logging out to configure another device. Log out of what? I think this is assuming you have enabled remote control. It probably does not mean logging out of the Wi-Fi network your iOS device is connected to. But, it's not clear and it should be. Now that both iOS and the second Android device were working, I tried the first Android device again. It failed again, still "unable to locate device". What could be different about the two Android devices? They were both running the same version of the AmpliFi app and were both in the same room with the router and the Mesh Point. My first guess was that the device was no longer connected to the same SSID as the Mesh Point. There was another SSID in the area that the Android device had used before. Perhaps, while the Mesh Point was re-booting to install new firmware, the device had connected to that other SSID? It was a great guess, but that was not the problem. My next guess was the the Android device had connected to the router rather than the Mesh Point and from the router it could not find the Mesh Point. The WiFi Analyzer app shows the MAC address of the thing your device is connected to along with the MAC address of both the router and the Mesh Point. WiFi Analyzer confirmed that the problematic Android device had connected to the router. Also, the app on the second/working Android device showed itself as a client of the Mesh Point, proving it had connected to the Mesh Point rather than the router. So, why can't the AmpliFi app find the Mesh Point on a device connected to the router? I don't know. I thought for sure that I knew, but I don't. My guess was that the problem had to do with devices on the same SSID not being able to see each other. The SSID in question was something like a Guest Wi-Fi network. More technically, it was in a VLAN with Layer 2 Isolation enabled. Simply put, this means that devices connected to the same SSID are not able to see each other. Each device thinks its the only one connected to the router. To fix what I thought was the problem, I converted the SSID to a normal one where connected devices are able to scan the network and discover other devices. Then I re-started the AmpliFi app and it worked, it was able to see the Mesh Point. Finally. But, this was a scam. The Android device had connected to the Mesh Point rather than the router. Still, I took the opportunity to poke around the app. It reports the signal strength of a device to it, as a percentage. This was a bit annoying as my router reports signal strength using negative dBM values. This makes it hard to compare apples to apples. You can give devices attached to the Mesh Point user friendly names in the app, just remember to save this by clicking the white check in the upper right corner of the screen. The next day, I reset the Mesh Point and connected to a different SSID. At first this went fine. An Android 8.1 device could talk to the Mesh Point and all was well. However, later the same day, the Android 8.1 device would hang and never connect to the Mesh Point. There was no error message, just a "Please wait...." I verified that I was connected to the Mesh Point rather than the router. This was all local, no remote access involved. Yuch, just yuch. When using any Wi-Fi extender, you have to expect that monitoring gets more complicated. This is certainly the case here. For example, when two devices are connected to the Mesh Point, my router sees three devices with three different IP addresses but all sharing the user friendly name and MAC address of the Mesh Point. From looking at the router, there is no way to know what those three devices are, you need to check the AmpliFi app instead, with one exception. The Mesh Point itself will appear to be Ethernet connected to the router, while devices talking to the Mesh Point will appear as wireless devices. Thus, to see the signal strength from the Mesh Point to the router without the app, just look at the signal strength of a device talking to the Mesh Point. Also, all three devices show up in the router as having the signal strength of the Mesh Point. To learn the signal strength between a device and the Mesh Point requires the AmpliFi app. IP addresses are a bit confusing on the Android side. Assorted networking apps, such as Fing and Wi-Fi Analyzer said my device had an IP address ending in 115. However, the AmpliFi app said my IP address ended in 113. The AmpliFi app needs to do a better job explaining whats going on, the IP address it reports is that of the Mesh Point, not of your device. When Fing running on Android reports the details of the router, it show the correct IP address of the router, but also, that the router was made by AmpliFi, so it is clearly confused. However, Fing also shows the 113 IP address under "More IP addresses" for the router. This worked fine. When I enabled Remote Access from an Android device, it asked me to pick a Gmail account to use for this. I did, and then connected the Android device to a different SSID. No problems at all hooking up to the Mesh Point while connected to that other SSID. As noted initially, this is just my latest skirmish, I have fought other battles with AmpliFi and their Mesh Points. The Mesh Points are not worth fighting for. Jim Salter tested them in detail (here and here) and found they are very directional. As I recall he found that the front was much more functional than the back. Thus, if a Mesh Point sits between you and a router, if the front points to the router, your signal will stink and if the front points to you, your signal will also be weak. However, if you just need the Wi-Fi signal to travel in one direction, it should be fine. There is another approach, however - you can make an AmpliFi mesh network with just the square routers, no Mesh Points at all. I love their routers, the circular display, for example, is a really great feature and they have four Ethernet ports. If you are inclined towards AmpliFi, this is clearly the way to go. I don't know if a router can be used, like the Mesh Point described here, to extend an existing Wi-Fi network from a non-AmpliFi router. Another downside to AmpliFi is that its a rare mesh system that does not self-update its firmware. Also, there is no way to turn off Bluetooth even though it is seems like its only needed the first time a Mesh Point is configured. A big upside for AmpliFi is that it stands alone. This is great for anyone concerned with privacy. 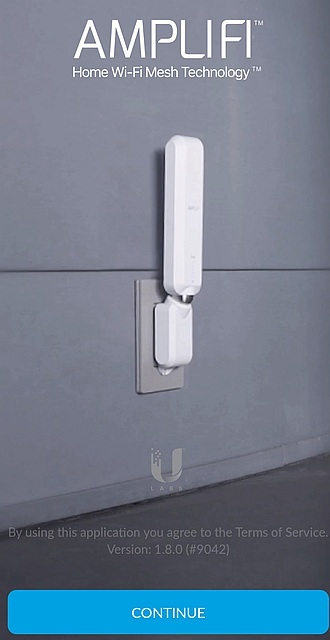 You do not need an account with Ubiquiti to use their AmpliFi devices. Unlike other mesh router systems AmpliFi does not phone home with information about the goings-on on your network. Note that the Mesh Point always talks to client devices on both Wi-Fi frequency bands. In my case, the router was 2.4GHz only, so the Mesh Point provided 5GHz access. However, since it has to use 2.4GHz to talk to the router, this is not really a big deal. Still, being able to configure the Mesh Point to use either frequency band to talk to the router, is a great feature, as sometimes you need distance and sometimes you prefer speed. A network with only routers (no Mesh Points) also lets you choose the frequency band used to communicate with the main, outward-facing router. Finally, a warning about WPS. Initially, AmpliFi did not support WPS. Then they added it the firmware but didn't tell anyone. Then they came clean and let you disable WPS in the app. However, that seems to be a scam. Even with WPS disabled, Wi-Fi scanning apps show that WPS is still enabled. Tech support told me that, nonetheless, its all good. I shouldn't worry. Personally, I want nothing to do with WPS at all. Another article about using a stand-alone Mesh Point as a Wi-Fi extender: AmpliFi Mesh Point HD review: The benefits of a mesh system with your existing router by Rita El Khoury for Android Police Apr 21, 2018. The author also had problems with the app not being able to connect to the mesh point. I still have nightmares about this. The author lives in the EU and her electric wall plug was angled wrong, so her Mesh Point goes sideways.